It's raining here today (not something we say often in CA) and I always like to be working in the craft room when it rains. If it's not too cold I sometimes even open the window so I can hear it better. Well today I thought I experiment a little more with the Distress Crayons. Follow along and I'll show you what I did. 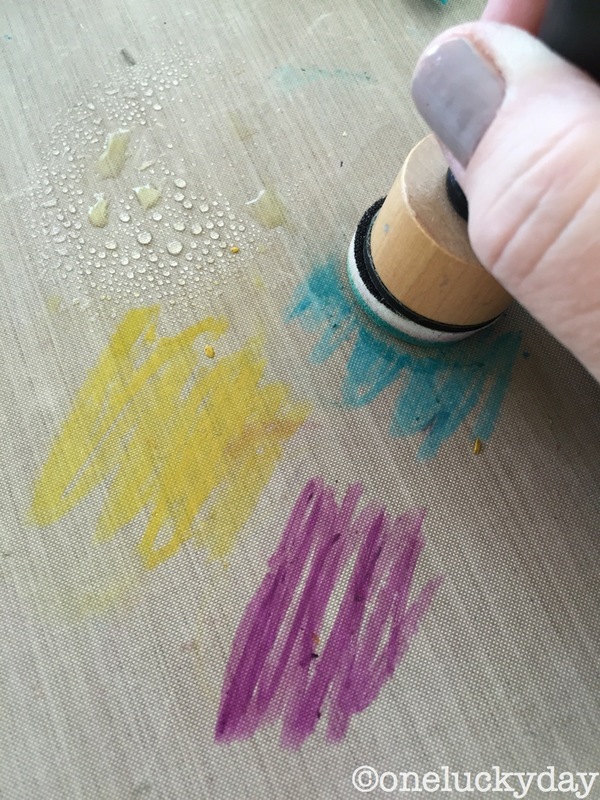 Scribble out some crayon on to the craft mat. You will also need a Mini Blending tool and a bit of water. 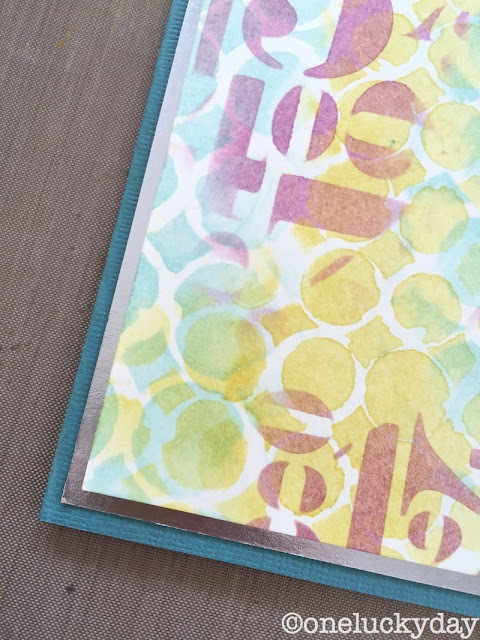 I cut a card front from Mixed Media paper and used a large stencil to add a pattern with the Blending Tool. Now go back and pick up another color. Same blending foam (no need to change the pad) - I just pounced it on the paper towel a couple times before going into the Fossilized Amber. 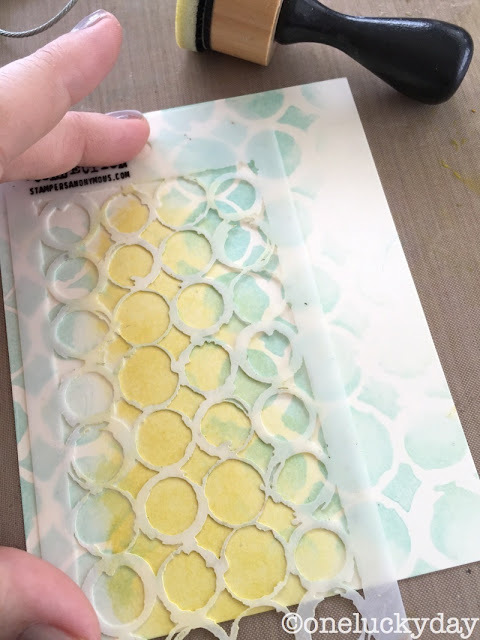 This time I'm using a Mini Stencil to change the scale of the circles. 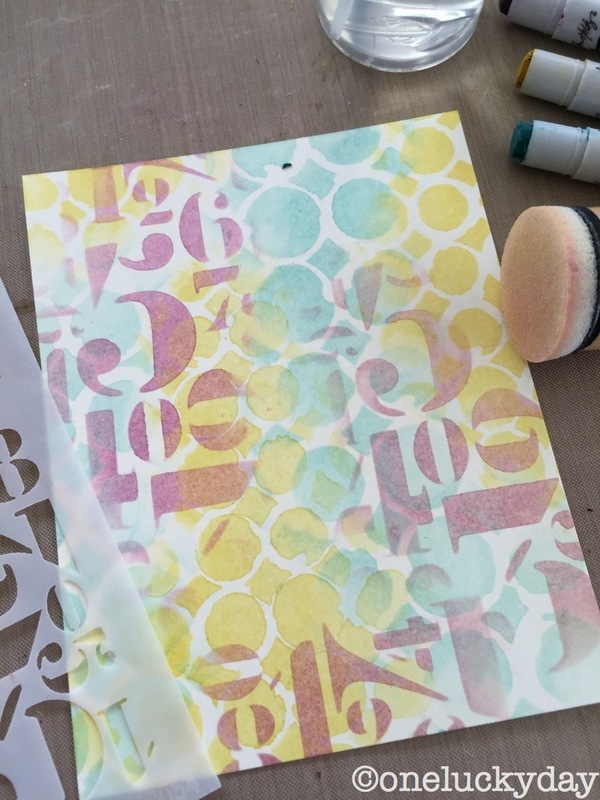 Another Mini Stencil to add some numbers with Seedless Preserves. I mounted the card from on Silver Metallic cardstock and then on a turquoise Kraft Core. A little stitching around the card finishes it off. 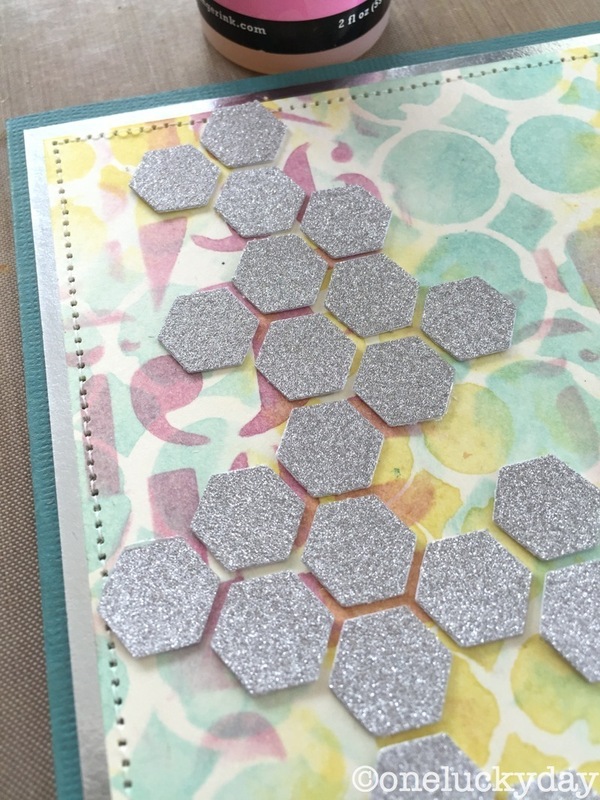 Next, I mounted the self adhesive Deco Sheet onto a piece of cardstock then punched tiny 1/2" hexagons using the Tim Holtz Hexagon punch. A quick way to make a lot of hexagon pieces. A dot of Glossy Accents works perfectly to adhere the hexagons to the card front. A sentiment from the Hashtags stamp set. I thought the card needed a bit more detail so I used Ranger Watercolor paper and the Tattered Flower Garland to cut a few small flowers. They have been colored with Distress Inks and a waterbrush. 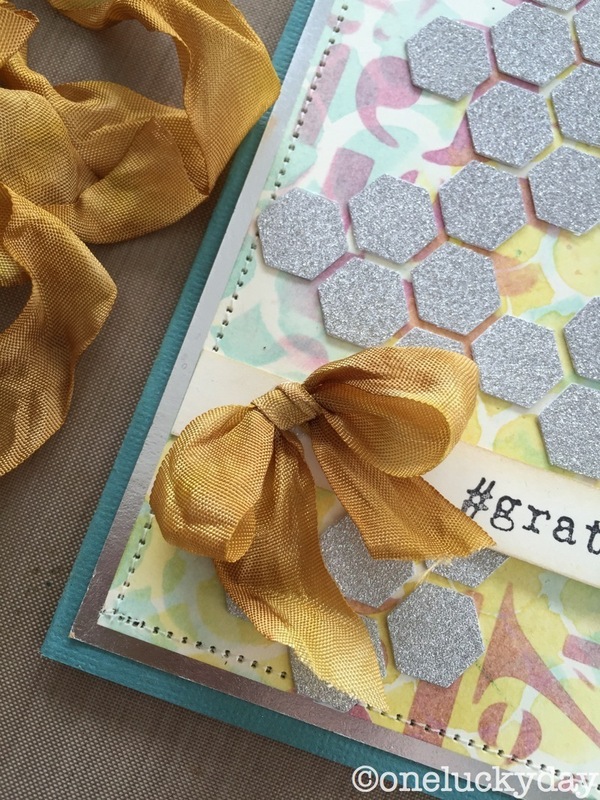 I adhered a small Crinkle Ribbon bow with Glossy Accents. And then added the flowers. These flowers have a hole in the center for layering with a brad. I find that if you bend and squish the flower to make them more realistic, the hole fades away. I added a Heart Charm to complete the cluster. Its hard to show the shine of the silver Deco Sheets but that textured surface really makes the card fun. 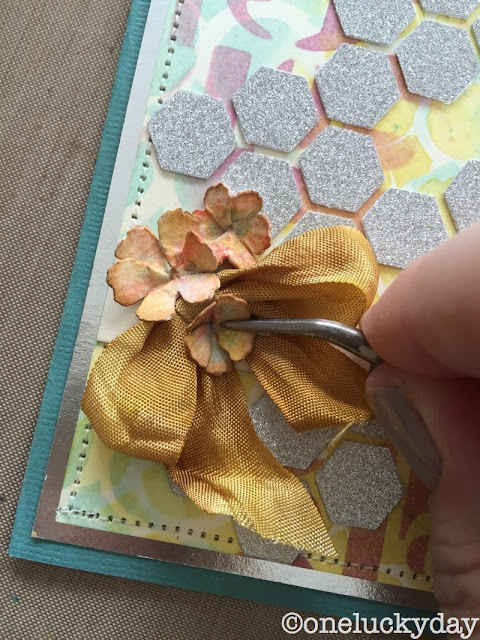 The hexagon punch was super easy to use to create all those hexs...can't imagine doing that by hand. Well, I hope you will try the crayons/blending tool technique to make a background. I ended up creating a few card fronts while I was experimenting. 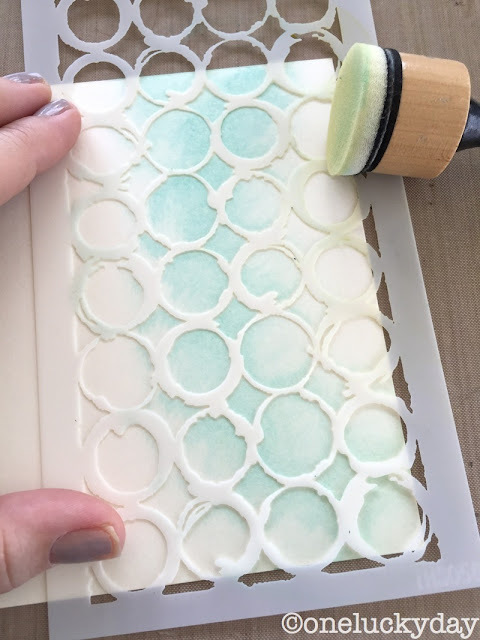 I found that more often than not, I did not even have to wipe off the foam pad between colors (that foam pad is kinda magic). I think this would be a great way to add color to an art journal. I guess I better try that size surface next! 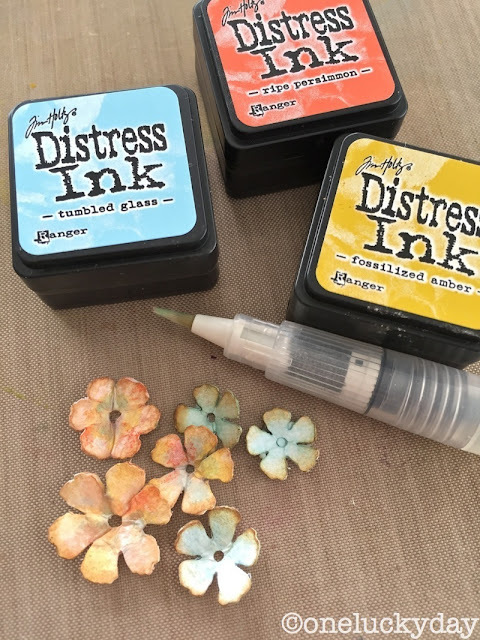 Labels: Distress Crayons, easy cards, layering stencils, paula cheney, ranger, tim holtz, tim holtz hexagon punch, tutorial, water brush, watercolor flowers. 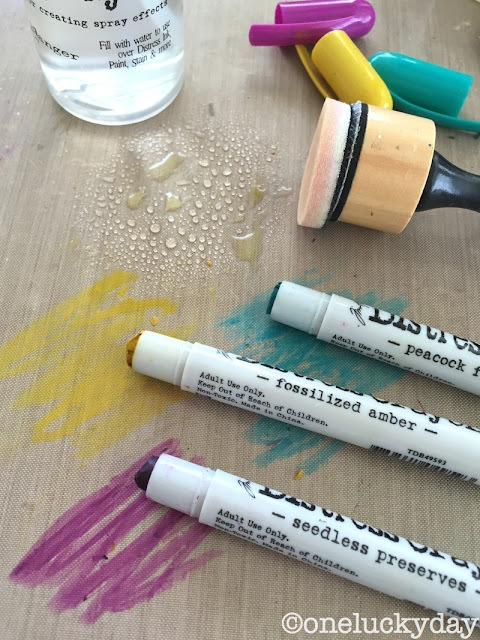 FAbulous way to use the crayons, showing again that the distress range is so versatile and fun to play with. You are so clever! Love this card. Amazing, then of course all your creations are amazing. The Background looks fantastic :) love the crayons. LOVE THIS!!! 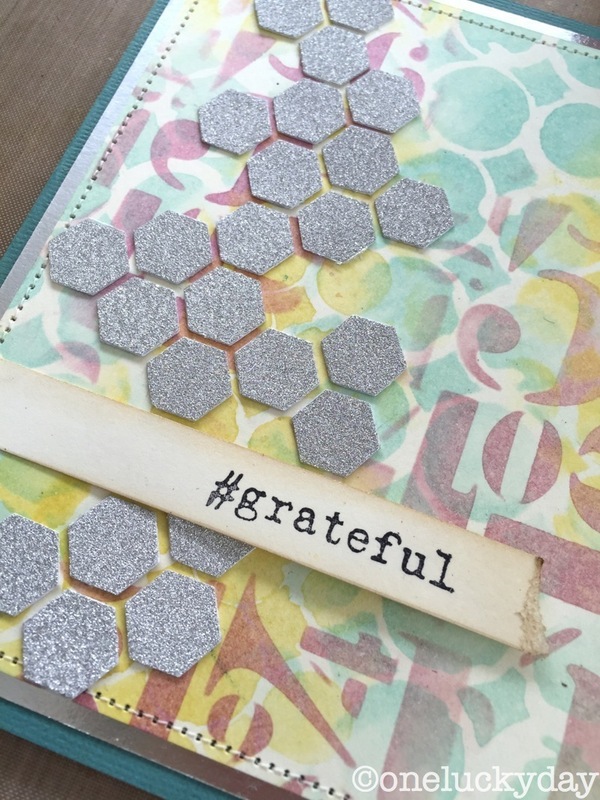 Thank you for the great inspiration, sweet friend!! Soft subtle tones with a pop of shine. Sweet. 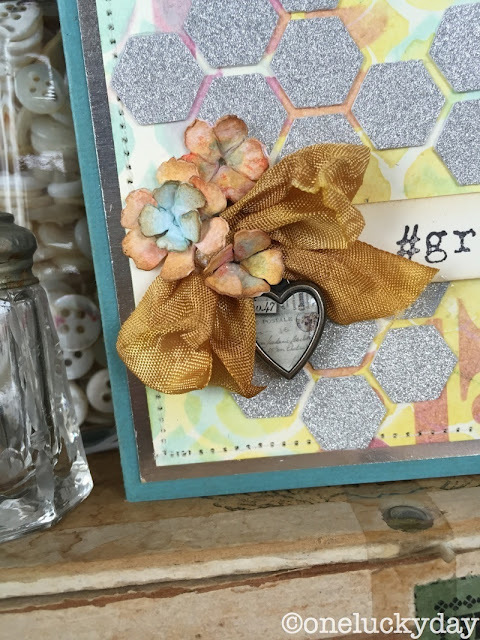 Great Tutorial Paula, your card is amazing! The Distress Crayons are amazing to work with! Great tips Paula. Always inspiring. WOW !!! What a great nice tutorial, now I have to try immediately, thanks Paula! Your experiments are so inspiring! TFS Paula! 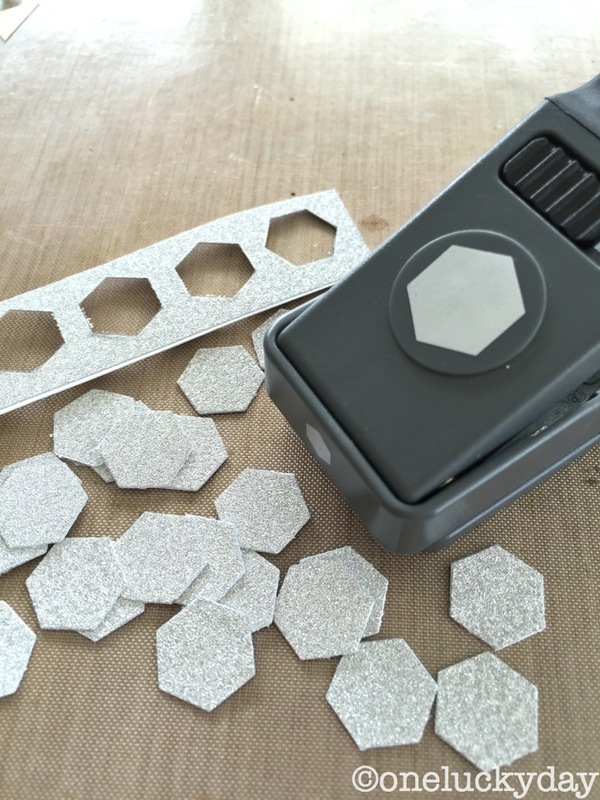 Okay, now I HAVE to get the mini stencils! Love this Paula, thanks for the tutorial. Thanks for sharing this way to use the crayons Paula. My first set of crayons arrived in the post today. Can't wait to try them out. Beautiful card Paula! Love the tutorial, now I have to get my crayons out and play a bit! Such a cool look!! love that! Beautiful! I love the hexagon punch. were just astounded and mesmerized by the selection of color you have focused on! they look incredibly harmonious! Nice! Grateful for that! And you don't like cards!!!! This is beautiful!!!!!!!!!!!! There are so many distress products, Paula, and although it's tempting, I don't want them all. What made you choose the crayons for this project? I see people using them for outlining and shading. When do you find yourself reaching for the distress crayons? Marcie, This was just an experiment to juxtapose what others have been doing. I had only been seeing the crayons used in very dark shades and wanted to find a way to use them in a more subtle way. Goodness me, this is FABULOUS! What a wicked cool technique!! Love the way that background turned out! 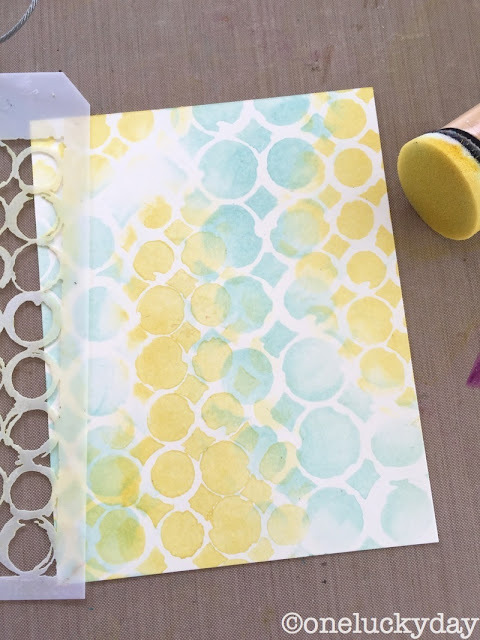 Really a great way to use Distress Crayons! Very nice card. 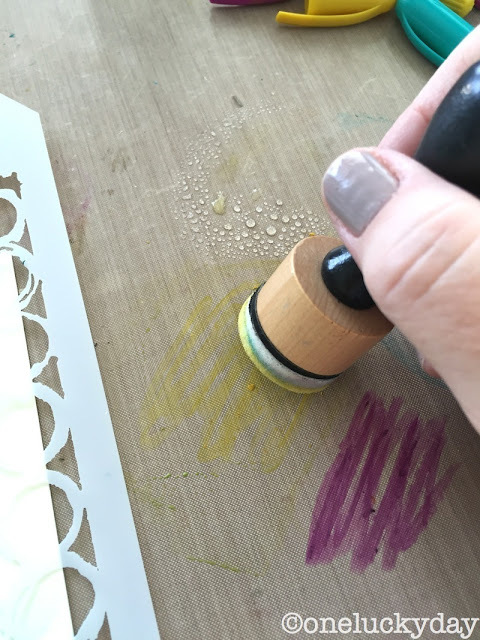 I would have never thought to use a mini blending tool. Thanks. Awesome project.